TG4 HAS CONFIRMED that the episode of its soap opera Ros na Rún featuring the cameo from famed British actor and writer Stephen Fry will air tomorrow evening. Ahead of the broadcast – with the show airing tomorrow night at 8:30pm – the show’s producers have released a quick video profiling Fry’s appearance, which was filmed in December at the show’s set in Connemara. The spot in the show came as part of a series documenting the modern state of the world’s minority languages, Planet Word, which will air later this year. Our impressions of the video are that the cameo seems a little on the short side – but that the show’s cast were obviously bowled over by the Englishman’s magnetism. Here’s some segments of the scene, where Fry – an English tourist, predictably enough – meets publican Tadhg Ó Díreáin and resident barfly Séamus Ó Catháin, as he wanders in looking for directions. 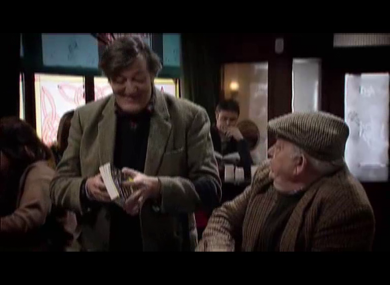 Email “Here's a peek at Stephen Fry's cameo on Ros na Rún”. Feedback on “Here's a peek at Stephen Fry's cameo on Ros na Rún”.